To be operated MuSE offers graphical interfaces and a documented commandline interface in the good old unix style. 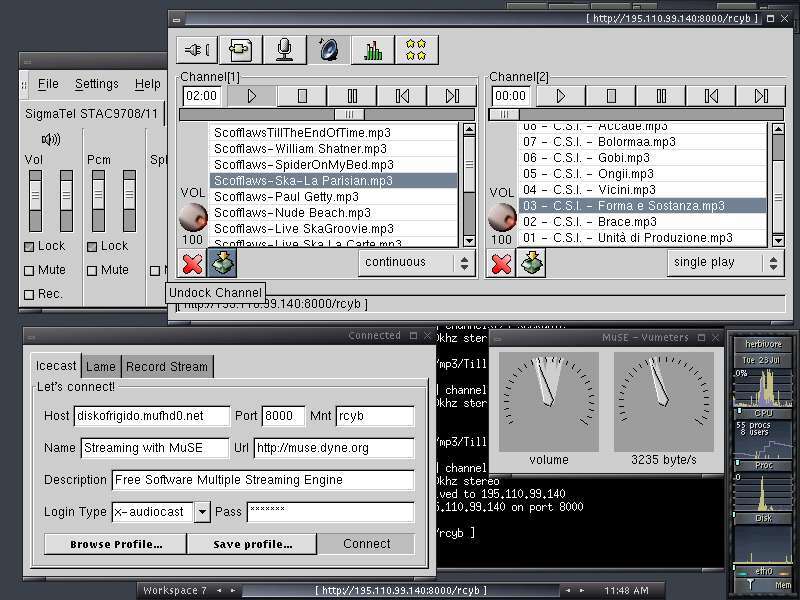 encodes at different bitrates and sends multiple mp3 or ogg streams to icecast, shoutcast and darwin servers. You need a POSIX.1b OS, GNU/Linux and FreeBSD are well tested. An OSX binary has been released and is available in the download section below. If you have success compiling MuSE on Win or Beos platforms let us know! LAME libraries, lame is the best mp3 encoder around and is free! OGGVORBIS libraries, Ogg is the future of free streaming! remember that if you compile from source using those libraries installed from the packages of your distribution, often you also need to install the -dev version of the libraries. 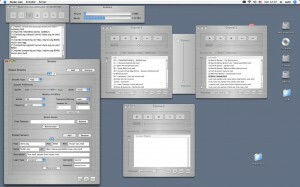 MuSE is written in C++ and is a multithreaded application. It reads streams using the included libmpeg library (mp3 format) and it can optionally link the OggVorbis library to read ogg files. 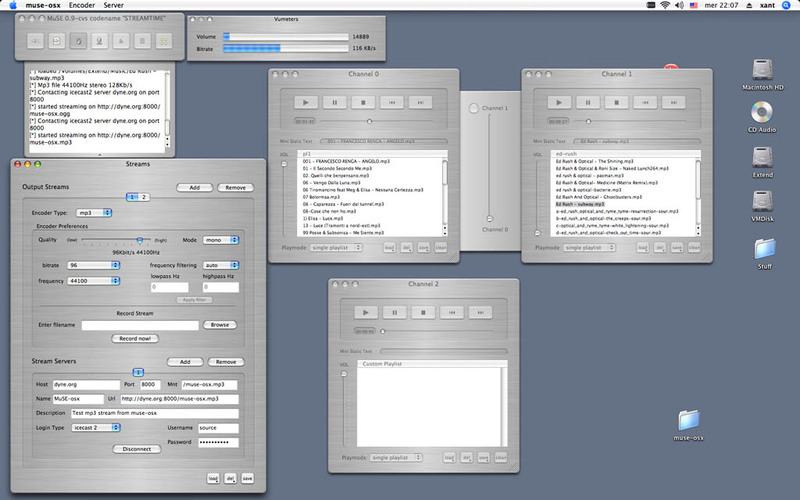 For encoding the sound into mp3 it can optionally link the LAME encoder as a shared library using it thru API calls. MuSE also features much interactivity implementing two user interfaces: a GTK+ one for XWin environment and a NCURSES for text console, while with ‘muse -h’ you can have a full set of commandline options. Latest version is 0.9.2 released on 27 December 2005, more about it in the NEWS and ChangeLog. Source release is signed using GnuPG. MuSE streamer also includes code by Matteo “MoP” Nastasi (resample and clip), Woo-jae Jung (mp3 decoder), Jack Moffit and Chad Armstrong (libshout), Mike Glover (cdk/ncurses) and modified code from Scott Manley (stream mixer) and Charles Samuels (buffered FIFO Pipe). The fundaments of MuSE existance where set by August Black and Markus Seidl. Refer to the AUTHORS file for a complete list of contributors. It has been a long while since this software wasn’t updated, if you are practical with code you are welcome to file detailed bugreports here. MuSE exists since the year 2000 and it works fairly well for what we need to do. 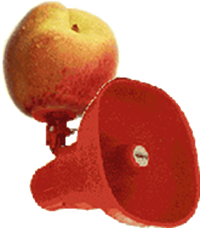 However, in the meantime more people got active in developing audio streaming technologies for web radios and here we list efforts we think are worth having a look, all Free as in speech. Of course you should already know Icecast. If you don’t, get ready because that’s our favorite streaming server. The R.O.S.S project lists more free radio tools and is yearly updated with good stuff.